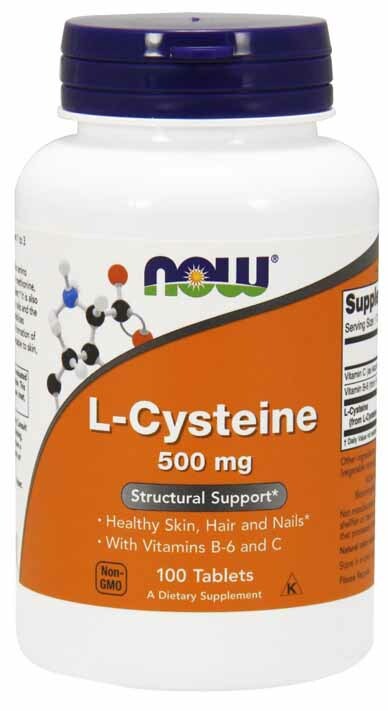 NOW L-Cysteine is a non-essential amino acid that is an important component of hair, nails and the keratin of the skin. L-Cysteine stabilizes protein structure and aids in the formation of collagen, thereby promoting healthy skin, hair and nail texture and elasticity. As a dietary supplement, take 1 tablet 1 to 3 times daily as needed. Cellulose, Citric Acid, Silica, Magnesium Stearate (vegetable source) and Vegetable Coating.